Are you looking for an ATX power supply that has 24VDC input? It just is not practical to extract 24 Volts directly from the ATX PSU. 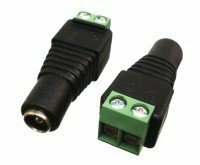 You can't use two of the 12V lines in series because they have a common ground (and actually they are from a common source as well). You might try the -12 and +12 but there is very little power available, and you still have to be worried about the 24V device's grounding, since that source of 24V has to be floating. But what you can do, and very easily, is to use a DC/DC converter. This little module is very useful for this purpose, and can get you up to 50 watts (or higher for short spurts). So even though you can't get 24V from the ATX, you can "cheat" by including another DC converter, the PST-DCBP-24V. The best source of power in the computer is the +12V rail. The PST-DCBP will boost 5V or even 3.3V to +24V, but the efficiency is lower, so to control the heat you would have to limit the power to 10W to 20W. The +12V rail also contains most of the power in the larger ATX PSU form factory. And if you want a different voltage, you can adjust the trim-pot over a wide variety of voltages, such as 15V, 19V, or 21V. To tap power from the computer use one of the spare hard drive connectors, the yellow wire is +12V, and the black wire is, of course, ground. Note: the output voltage is adjustable by a trim pot from the top of the package. 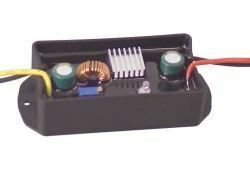 We will adjust it to 24V before shipping unless you request a specific voltage when ordering. Over current protection Yes, by reverse biased diode across the input terminals. A fuse in the input line is required to prevent damage.